Are You Ready for Your Adventure Outdoors? Adventure outdoors in Hilton Head Island, South Carolina and discover the remarkable natural beauty of this island. Kayaking, fishing, deep sea fishing, dolphin tours, historical tours of Daufuskie Island and bike riding on miles of paths are just a few. Infinite opportunities for adventure outdoors exist. Youll fall in love with Hilton Head, SC and never want to leave like us! Dont worry you can have an active vacation here anytime of the year, Hilton Head Islands subtropical climate makes it ideal to enjoy the outdoors year-round. And with so many things in the area to experience the time will go by all too fast. So below we have listed some of our favorite adventure outdoors on Hilton Head, South Carolina. Is your family the adventurous type? If so, your vacation will be a blast! The tidal creeks and marshes around Hilton Head will be your water highway. You do not have to be an expert to have fun on your kayaking trip. Still, if you are unsure, there are guides that can lead you through the tour. It will be a great adventure outdoors and you'll be glad you decided to go. 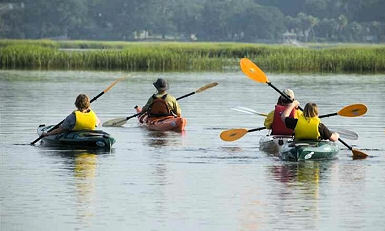 Hilton Head Island South Carolina has a beautiful coastal habitat, the best way to see it is Hilton Head kayaking. My kids love this tour; we always end up kayaking with the dolphins. This is the coolest part for them! The tidal creeks and the salt marshes are home to the herons, osprey and fiddler crabs. You may also want to consider a kayak tour around Pinckney Island if you enjoy birds or an outback Hilton Head kayaking trip where the scenery is unbelievable and the experience incredible; a unique adventure outdoors for nature lovers. Kayak fishing is an awesome experience! It's a fun way to fish where the powerboats can't get to. Your guide will show you the best spots to catch redfish and spot-tail bass. This would be a good way to spend quality time with your family. Click here to read more about Hilton Head kayaking. Hilton Head, SC offers deep sea fishing, shark, fly and fresh water fishing. No matter what kind of fishing you choose youre sure to catch something good. A license is not required for saltwater fishing but the islands lakes and ponds do require a license. To purchase a license try Wal-Mart at Festival Center or True Value Hardware in Coligny Plaza. A memorable adventure outdoors is Hilton Head deep sea fishing. You can take a Hilton Head charter fishing trip to catch amberjack, barracuda, shark, king mackerel and more. Everything needed for fishing is provided except for food and drink. Here is a real adventure! How would you like to catch a shark? If you're on Hilton Head, South Carolina during the months of April through September the sharks are plentiful. Black tip, dusky, hammerhead, lemon, sharp nose, bonnethead, and bull sharks cruise the waters around Hilton Head and will allow you the best shark fishing available. The travel time to shark fishing grounds is not long. If you're interested in the best fly fishing around and want to know the techniques, this is the perfect place to learn. Many fish exist in the low country that are perfect for fly fishing. There are Spanish mackerel, bluefish, jacks, cobia and ladyfish. Although the preferred fish for fly fishermen are red drum or redfish. Inland fishing is good between September and December. If freshwater fishing is more to your liking, there are many types of fish to catch as well. From catfish to bass to crappie you will catch plenty of fish and be able to brag to your friends when you get back home. Yes, you are the fisherman! 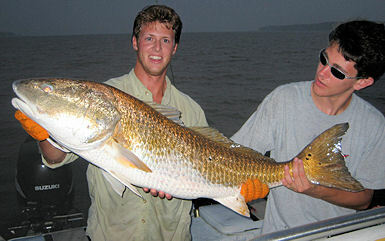 Click here for more information on fishing and Hilton Head deep sea fishing. Crabbing is also very popular and fairly easy in the low water right off banks or from a dock. This is an adventure outdoors that you will not soon forget. A guided tour will be the best bet because the guides are very knowledgeable when it comes to what this area has to offer. They know where to find dolphins for an up close view. As a matter of fact if you are touring in a kayak the closeness may be somewhat overwhelming. The dolphins are so close you can reach out and touch them. When planning your Hilton Head Island activities and great adventure outdoors, the eco tours are certainly one choice. What do you want to see? If dolphins are on your list, the Calibogue Sound, which is not far, is an excellent place for viewing the Atlantic bottlenose dolphin. You will want to go when it is just about high tide as this make navigating to the areas you want to see much easier. Low tide will not allow you to access some of the waterways. This can limit the places you can go to watch and enjoy the dolphin in their natural habitat. One of my favorite Hilton Head Island adventure outdoors and Hilton Head attractions is the Dolphin Eco Tour, its a very peaceful and relaxing tour also an excellent way to watch the dolphin play. Trust me the kids will love it, especially if they're too young to take a kayak tour. 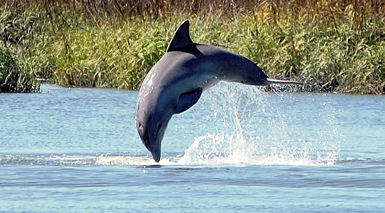 Read more about Hilton Head attractions - Dolphin Eco Tour. Daufuskie Island tour is one I highly recommend especially if you enjoy history. Daufuskie Island, a secret sister island of Hilton Head, SC, has a natural beauty with abundant wildlife, forests and pristine sandy beaches. Take this tour to step back in time where a simpler life with peace and tranquility still exists; there is no hustle and bustle of the real world on this island! There still exists a strong reminder of antebellum times with a few descendants of former slaves (Gullah) living on small farms. Daufuskie Island guided tours visit numerous fascinating historic places such as White School, First Union African Baptist Church (built in 1882), the Praise House, the Mary Field's School (memorialized by author Pat Conroy in his novel "The Water is Wide", and the site of the Bloody Point Lighthouse. Read more about Daufuskie Island tours. Information on self guided tours and Daufuskie Island ferry schedule. This is one of the great things about Hilton Head Island, South Carolina, the bike paths are numerous! If you want, you can cycle from one end of Hilton Head, SC to the other. The plantations are not all accessible by bicycle but there are plenty of places to enjoy a bike ride. If youre into bike riding this will be the perfect place to enjoy the sites while bicycling along the 23 miles of protected bike paths. Sea Pines Plantation is our favorite area to ride bikes. Theres lots of shade and the scenery is breathtaking with the Spanish moss dangling from the trees. An amazing variety of bikes you can choose from like mountain bikes or a bike built for two. Many can be delivered to your hotel with all the gear needed for a safe adventure outdoors. Prices are very reasonable. Some rental properties come with bicycles already. There are also miles and miles of beach to enjoy while bicycling. The sand is firm enough to ride on especially at low tide. This is definitely one way to take pleasure in all the sites and be able to watch a sunset , dodge the waves ( my kids always end up in the waves!) or see the natural beauty of this island up close. Learn more about Hilton Head bike rentals. There are many different events that are constantly being schedule by Outside Hilton Head. They offer seasonal tours, weekly adventures like Dolphin Eco Tours, Outback Tour of the lowcountry and Guided Kayak Nature Tours. One of the best things that Outside Hilton Head does is to combine a love for the outdoors with excellent adventures there. With Guided History Tours, you can learn about the outdoors while you are having an adventure in them. Not only does Outside Hilton Head have a great series of outdoor adventures that you might want to partake in, but they've also got a wonderful Outside Hilton Head store, where you can find all of the great outdoor clothing and gear that you might need. The store is located in The Plaza at Shelter Cove on Highway 278 near mile marker 8, just a walk down from Giuseppis and next to Piggly Wiggly. While visiting the store you can book your adventure outdoors and lay in one of their hammocks. Spa-even the word sounds inviting! Most of the resorts on Hilton Head have a spa. To me they all are good; I have not been to a bad spa yet! Why not experience the ultimate in personal pampering and start your vacation out (it helps you to relax and get in the vacation mode) with a little self indulgence. Spa treatments maintain and improve your health as well as enhance your overall well being. Spa treatments are for everyone, even for families who want to enjoy some quality time together. Take the time to unwind, relax and get rid of the stress, after all, the good life is lived one week at a time.